‘The past does not need to be the future. A new world can begin today. 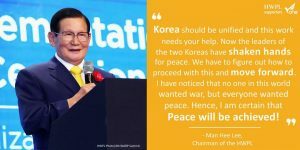 It is the last chance for the peace of humanity.’ These sentences come from promotional video of ‘2018 HWPL World Peace Summit: 4th Anniversary of the WARP Summit.’ This video shows very well what kind of mindset when they are dealing with world peace. They think that achieving peace is ‘Out Duty that we have to do’ of our time at any cost. Can you feel their determination? Thousands of leaders and citizens from around the globe will gather for 3 days in Republic of Korea with the great determination of creating a peaceful world together. I will tell you their HWPL peace quotes with Man Hee Lee. “Today one country saying ‘yes, Chairman Lee I accept your declaration’ is not enough, even 10 countries saying this is not good enough. Therefore, we need the United Nations. In fact, the United Nations came out in 1948 from the Human Rights Declaration and that is a very good document but things have changed from 1948 until now and, therefore, it is necessary that the United Nations adopts the Declaration made by us…so that when the United Nations accepts it, it becomes binding to all the countries in the world. “I lived under a communist dictatorship that deprived the country and its citizens of freedom for 50 years. People were not allowed to move about freely and the political police monitored their private affairs, invading the privacy of all citizens. 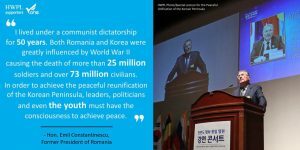 Both Romania and Korea were greatly influenced by World War II. This war caused the death of more than 25 million soldiers and over 73 million civilians, as well as created huge economic losses and led to the destruction of many world cultural heritage sites. The atrocities of the two wars in the first half of the 21st century proved to be insufficient for leaders to understand that peace cannot be strengthened only by managing frozen conflicts,” explaining the darkest times of Romania. “Korea should be unified and this work needs your help. Now the leaders of the two Koreas have shaken hands for peace. We have to figure out how to proceed with this and move forward. I think the leaders should hear your excellent presentations and statements from today. I will never forget your suggestions and the efforts that you have shown, and I will make sure everyone sees and hears your messages of peace,” promising to continue to make such achievements in the future.